I love to cook and bake. There’s nothing I enjoy more than puttering around the kitchen, trying new recipes and coming up with new creations of my own. My cookbook cupboard is jam-packed and the bookmarks list on my computer is dominated by cooking and baking sites. If I love you, there’s a good chance I’ve demonstrated those feelings of friendship and affection with a plate of fresh cookies or a pot of soothing soup. Even when a recipe fails, I feel like time in the kitchen is well spent because I have invariably learned something new. This is how I feel about making food for family and friends 11 months of the year ... and then there’s August. If it had escaped your notice, it’s hot right about now. Warm temperatures outside dampen my appetite like nothing else. (I maintain that I would be much thinner if I lived in the tropics!) In addition to that, it seems cruel and unusual to turn on any heated cooking appliance inside the house when you could practically fry an egg on the sidewalk outside. So, mealtime during August at our house can be fairly unexciting. Sandwiches figure prominently in our diet, as do lots of fresh-sliced raw fruits and veggies, which luckily are now at their peak in the farmers markets. Dessert in August is a different story. Dessert can be cold and refreshing. Dessert can be delicious when it’s made in the freezer. Dessert is quick and easy when it’s cold. Cold desserts can be so great, in fact, that sometimes we skip supper altogether and go straight for the grand finale. Homemade ice cream is always a winner, and I love a good slushy on a hot evening. A real favorite is a slushy punch that my mom used to make for big summer parties. It consists of a six-ounce can of limeade concentrate, 11 cups of water and three cups of sugar. Stir all that together and put it into a plastic container and freeze it. About a half an hour before you want to drink it, take it out of the freezer to soften, then break it up with a large fork. Place in a large bowl, mix with two liters of lemon-lime soda and stir until thick and slushy. Sweet, sticky and so great on a hot day. This year, I’ve been experimenting with ice pops. I purchased a set of silicone tubes meant for freezing them, and this modest purchase has unlocked a whole world of possibility. The tubes neatly solve the problem of what happens with those last few bites of a frozen treat on a stick – something that always kept me from enjoying what was otherwise an outstanding dessert. I got the “Cosmos” ice pop maker mold set on Amazon for about $15 a few months ago, and suddenly ice pops are on the menu at home several times a week. Ice pops can, of course, be made with nearly any liquid. 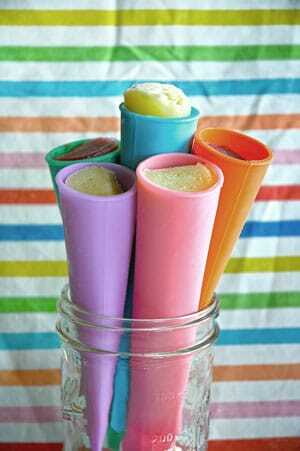 But I think that making a great ice pop involves finding combinations that complement each other. One new favorite of mine is a strawberry-watermelon combo that I made based on an agua-fresca drink I had in Mexico. In the blender, combine a cup of watermelon, a cup of strawberries, two teaspoons of honey and a squeeze of lime. Blend until very smooth and freeze until firm. This basic recipe would be good with several different combinations of fruit, and the sky’s the limit when it comes to other ingredients. For a decadent treat, add crushed cookies or candy to a base of softened ice cream mixed in a stand mixer. For something a little lighter and healthier, stick to fruit and juice like the tropical pop recipe here. I’ve added coconut milk and vanilla yogurt for flavor and texture, but purists could easily omit them. And once they’re ready, don’t forget to savor them a bit - much like an ice pop, the days of summer are fleeting and meant to be enjoyed. Blend all ingredients in a blender until very smooth. Pour into molds and freeze until firm.